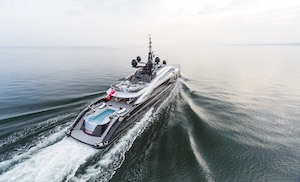 Ability to travel the world and meet new clients from all different cultures and help them in achieving their vision to finalise the look of a beautiful yacht, home or aircraft. Better still all three! Your favourite pastime out of work? Your favourite memory from your time at GF? Far too many memories to pick just one and for confidentiality reasons, I couldn't possibly share but to be involved with some of the world's most prolific people from Royals and diplomats to business leaders and the most discerning clients pursuing perfection in luxury. I love the variety of projects we get to work on and the people we meet. There is something quite special delivering a project which is unique and individual. Martial Arts. I was trained at a competitive level in karate, kickboxing, and Muay Thai. I have the belts and bruises as proof! I love laughing for no reason, any challenge and, of course, champagne. Avocado, sprouts and people with no manners. Visiting M&O as a team of six, including KG & JF. On the last night leaving the show, we were all exhausted but very happy with how the trip had gone, so we had karaoke in the back of the van, with all six of us singing at the top of our voices. The driver ended up driving around the block a few extra times until our had playlist finished! A team that sings together stays together! I do quite a Michael MacIntyre impression, sometimes by accident! I love being part of a team when something that we are all striving for comes together. What are your likes? What are your dislikes? Cautious, but hopefully quite caring and prone to use five words where one will do! Many years ago in the 1990's Kevin and I bought some special offer flights to Seattle. There seemed to be lots of yachts being built there at the time. We decided to keep a photographic record of the trip (an old-fashioned camera with film). We carefully wrote notes about where every photo was taken and felt pretty pleased with ourselves. When the camera kept counting after it passed 36 we thought we had a problem. We did! I hadn't put a film in the camera! So memories of The Pacific Northwest remain in the mind, but it was a memorable trip. I've always wanted to be able to at least get by in another language. I've tried learning French, Italian and Welsh! I've signed up for lots of courses and I've been to language teachers, but never got much further than 'Good morning. How are you?'! I've proved to myself that I haven't got much talent for languages, but I haven't completely given up hope! No day is the same. The people make it though; there’s never a day without laughter! Every client and every project is different which makes it fresh and exciting each time. Eating good food and watching good documentaries. Indian food, Italian food, thrillers and cleaning! Meeting everyone and becoming part of the team, it’s like a family here. I have represented England at the Cheerleading World Championships 5 times. Long walks in the countryside with my Labradoodle puppy, Merlin. I once had afternoon tea suspended 100ft in the air! Great team and working environment; seeing the company grow. End results with happy customers. Working with amazing products. I've met Liam Gallagher, and he was surprisingly charming! I’m extremely family orientated and love spending every Sunday at my mum’s. I also enjoy lazy weekends with my boyfriend and try to get to the gym when possible. Being made to feel welcome by the team. I’m an olive connoisseur, I can tell you the origin of an olive by its taste and texture (it’s probably something to do with my Greek heritage). The part of my job that I love most is working with clients to pull together linens and accessories to create their desired look and feel. Outside of work I like to watch stand-up comedy, both on TV and when I get the chance live. But of course, spending time with my son is top of my list when I’m not in work. Dancing the night away in a packed Rascasse with Kevin, Jonathan and the rest of the team at the end of another successful Monaco Yacht Show week. I have passed exams in and helped teach classes in Disco, Latin American and Ballroom dancing! The satisfaction when a project is completed and the client is happy. Christmas is always a good memory for me. We are all happy and share chocolates. The feeling when you complete a project and seeing the client happy with the result. Spending time with my little daughter, playing hide and seek. Family time and lots of chocolate! I love that every day and every project is different which sets new challenges daily which I enjoy! 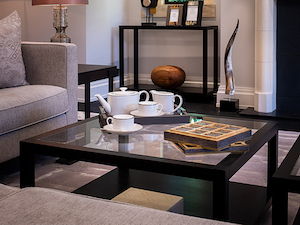 I also love the contrast of my role, some days I will be more creative where I will spend time in the showroom with clients, suppliers and colleagues, taking images of new products, styles and creating presentations. Other days I will focus on my organisation, for instance, quotes, invoices, POs, chasing orders, updating order status' and contacting clients/suppliers. I enjoy spending quality time with my family and friends either on a day trip somewhere fun or relaxing together and cooking food. I also love to plan and book weekend city breaks with my partner to tick off dream places from our bucket list! Festivals / Music events. Family time. Socialising. Cooking. Relaxing. Good manners. Onions. Dark mornings. Bad manners. My favourite memory so far was my first client meeting for M.Y. Victoria! It was very exciting and to be a part of this and to see the start of a project unfold. It was truly inspiring to see how the team work together in all areas sharing their knowledge and passion for the brands and industry. This moment strived my determination to push myself out of my comfort zone to become more involved as the meeting went on. It was a proud moment for me! Throughout my teenage years I used to be an Elite Olympic Gymnast, I used to train with the Olympic Medallists and compete against other teams for my age group at the time. Every day is a new challenge and getting to work with the most amazing products. I like to just chill at home or go out to eat, travelling when possible too. Every moment has been memorable since I’ve started, especially getting to know the team. I can speak fluent Chinese (Cantonese). Each project is different so it never feels like you are doing the same job over and over again. Travelling, reading and spending time with my family. My first visit to the shipyard in Holland where I could see how much work and attention to detail is being put into bringing a superyacht to life. Working with lovely, nice and helpful people. Video games, relaxing, spending time with family and watching as much F1 as possible. Video games, music from all genres and eras, Japanese food, Italian food, American food, desserts and watching as much F1 as possible. Slow internet, slow traffic, authentic Chinese food, badly cooked steak. Seeing the showroom for the first time. I have always enjoyed attending the Monaco Yacht Show, getting to meet and socialise with the people you work hard with all year round and seeing the yachts you've worked on. I also like getting the approval to go ahead with something you've worked on. Travel and seeing friends and family. Rudeness. Autotuned Pop Music. Posed Selfies. Sambuca. Spiders. Reality TV. Jonathan's failed attempt at juggling limes in a restaurant, resulting in limes landing from a height on someone else's table. I have sand-boarded down the highest sand-dune in the world. Travelling to see new countries, Japanese food & Cake! Being woke up at 6 am at the weekend - no more lie-ins! Rainy days and lazy people! My favourite memory is from Monaco Yacht Show 2013; boarding yachts, experiencing the rally on 'Place Du Casino' and getting drenched coming home from Sass Cafe! I love being a part of the whole project process, from initial concept to final realisation. Seeing the final products that you and your client have worked on so passionately together is really fulfilling. None of which would be possible without the support of our great team. I’m a big foodie so eating out with friends and cooking when I get time. Food, spending time with my hubby and baby boy, going on adventures, art, live music, girly nights, films. Jonathan doing karaoke on our Christmas party bus. He’s got a great voice! I used to play the flute but I’m not sure I could still hold a tune. The amazing range of projects we get to work on and my Colleagues. Having the chance to meet and work with a really lovely group of people. Cooking or going out to try new restaurants. Soaps (TV) and bad weather. So far, the yearly MYS Manchester Lunch with all the team. I am sure there's more to come! My favourite aspect of the job is working with the product and finding new ideas to show to clients. I enjoy surfing in my spare time, although I don’t get to do it as much as I would like (there aren't great waves in Manchester!). I've surfed in places like Portugal, Morocco and Australia, although Scarborough is the closest to home - and arguably the most exotic. Coriander and black pepper! Both food related, but I can't stand them. Jonathan juggling a lime over the balcony (onto a table below) at the Christmas do! Getting to meet all the different suppliers – their work is amazing and it’s great being able to see it in person! Spiders and olives. Very different but both horrible! I had my embroidery work featured in gallery exhibitions a few years ago! Seeing it displayed professionally was amazing! There are many great things about my role, the industry and our team. Creating fantastic exclusive pieces for clients using the best manufacturers worldwide puts you in some very memorable situations. Love travelling, been to some great places, but want to experience more. RS3, Portugal, say no more. My favourite thing about my job is that the business is constantly changing and adapting, which makes every day different and interesting. My favourite pastime is probably reading - sitting in a quiet corner with a strong cup of tea and a good book. Winning the company bowling contest – even if I was the weakest member of the team! I genuinely can't think of one – there might not be one!! Sardinia trip especially now the orders are coming in. I used to paint rude gnomes for a living. I love seeing and receiving new products and exceeding the clients’ expectations of what we have to offer in the showroom and also working with great people. Despite my fear of heights I decided to throw myself off Babadag mountain in Turkey at over 6000ft to do a paraglide! I love my job because everyone shares the same vision. I like the interaction between people and the collaborative environment. We all support each other and work together to offer creative feedback and then made our ideas a reality. My favourite pastime would probably be learning a new culture, including learning a new language, as I was a student in another country. I also really enjoy the arts and the outdoors. Spending time with family and friends, going out, cooking, visiting new places, being close to nature, fundraising for charities and watching TV series. Bullying. Animal cruelty. Being caught out in the rain. People arguing over the smallest thing. Discrimination and stereotyping. Horror films. I enjoy playing football twice a week. When a client's project has been completed and they happy with everything they have received. Being a father to two absolutely beautiful children. Good food, especially curry, visiting new places and watching movies. The sense of fulfilment when a job I've been working on gets completed and the client is happy. Outdoor activities (hikes etc) and being a scout leader. Friends and family, my dog and travelling. Adventurous, helpful and a bit wacky! I have a personal licence to teach Axe Throwing! Watching a vehicle leaving our premises fully laden with a project that I have looked after from start to finish, knowing that the client will be over the moon upon delivery. Driving from Monaco through the Alps. Learning new and different aspects of my job role. Training for kickboxing and eating good food. Seeing friends and family but most of all Chinese food. Throwing back a fair too many Vodka cranberries at the works night out. I don't have any, I'm an accountant! !